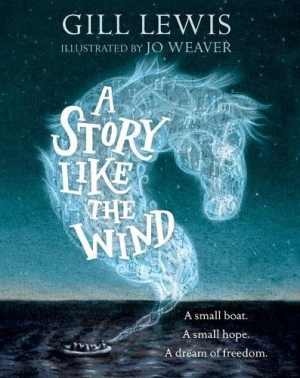 A Story Like the Wind is an ethereal and powerful story about freedom. Fourteen-year-old Rami is at sea on a small boat with a group of refugees. He wears a red scarf and carries his only possession, a violin. His fellow passengers ask him for a song and a story to hold back the dark night. He shares with them the tale of a young shepherd boy, Suke, and the magnificent wild horse he loves. When the horse wins a race, defeating the rich and powerful lord who rules over Suke and his people, the cruel lord takes the horse as his own, determined to tame it to demonstrate his superiority. The horse resists. Even when he is physically broken, his spirit stays free. In his story, the refugees hear echoes of their own fight for freedom. Even though it is brief, A Story Like the Wind is incredibly potent. The identities and stories of Rami and his fellow refugees are only lightly touched upon, but their journey across a dark ocean in a small boat is terrifying and realistic. Their isolation and sense of loss, and their brave search for freedom, is evocative. It is impossible not to feel the weight of their journey. Black-and-white illustrations accompany the text. They are delicate and slightly hazy—almost like memories rather than artwork. A series of musical notes flows from page to page, connecting Rami to Suke and the passengers to the story they’re hearing. A Story Like the Wind is a beautiful, memorable work of art. It is a story of overcoming oppression and the power of the spirit. It deserves a place of honor on any bookshelf.